52 Ancestors, No. 8: Antonino Rocco Scaletti, Prolific Sicilian Farmer | Photo Restorations by Tim G.
Of all the heros on my family tree, I believe none are more widely and openly venerated by his living descendants than this man, Antonino Rocco Scaletti. I say widely because that describes the breadth of his progeny. I say openly because he is the only one of my great-grandparents for whom photographs and memories are facebook news feed staple among his living grandchildren. Surely all of my great-grandparents are heroes, and well loved by those who remember them, but generally speaking, I don’t find out much about them unless I go asking. For “Nino”, as he was called, the photographs and memories come to me, through the modern miracle of social networking. Nino was my maternal grandmother’s father, and his grandchildren are my mother’s cousins. Researching Nino provided many genealogy ‘firsts’ for me. He was the first ancestor for whom I found a foreign birth record, a Sicilian civil registration. Nino was born at Via Tomasello 9, Trabia, Sicilia, Italia, and, according to the record, L’anno milleottocentonovantatré addì ventiquattro di Settembre. Although the record is in Italian, learning bits of Spanish growing up helped me to suss out the most of the vital information. Google translate helps with the rest. My advice with that is not to rely too heavily on the full sentence translation, but rather to confirm unfamiliar words individually. Although this building has a nice patina, I can’t say for sure if it has been here since Nino was born in 1893. Although, this is the location, I don’t know much about else about Nino’s youth. His parents were Giuseppe Scaletta and Maria Passafiume. My grandmother told me that the name Scaletta means stairs, although Google Translate returns stiles and stepladder as closer translations, and derives from the settlers of what is now Scaletta Zanclea, Sicily, who climbed natural stairs on the side of a mountain to get to and from their village. Sicily was a changing land in the mid 19th century. One of the period’s defining events, the Sicilian Revolution of 1848, centered in Palermo, which was just up the road from where Nino was later born, in Trabia. I’d be interested to know if any of Nino’s grandparents participated in that, and to what end. In 1861, after much fighting, the Kingdom of Two Sicilies gave way to a unified Kingdom of Italy. Surely these political events affected Nino’s parents and grandparents, but I am short on details. A mother lode of fascinating research awaits, I’m sure. Nino emigrated to America, and arrived at the Port of New York on May 11, 1912. My grandmother told me that several people from his ship, the Italia, dove into the water and swam ashore to avoid check in at Ellis Island. Nino stayed on, however, and good thing, too. His was the first ships manifest I ever found for an ancestor, and I found it on EllisIsland.org. Nino’s manifest indicated that he was to stay with his older brother, Carmelo, at Coraopolis, PA, just west of Pittsburgh. Nino had another older brother, Giuseppe, and an older sister, Angeline. My grandmother told me that, at Ellis Island, each brother received a different letter to end his last name, and that was to distinguish them more easily. I’m not sure why that was necessary. After all, the brothers had first names which suited that purpose, and they apparently arrived at different times, making such an effort tedious to coordinate. Nonetheless, Giuseppe, aka Uncle Joe, kept his name Scaletta. 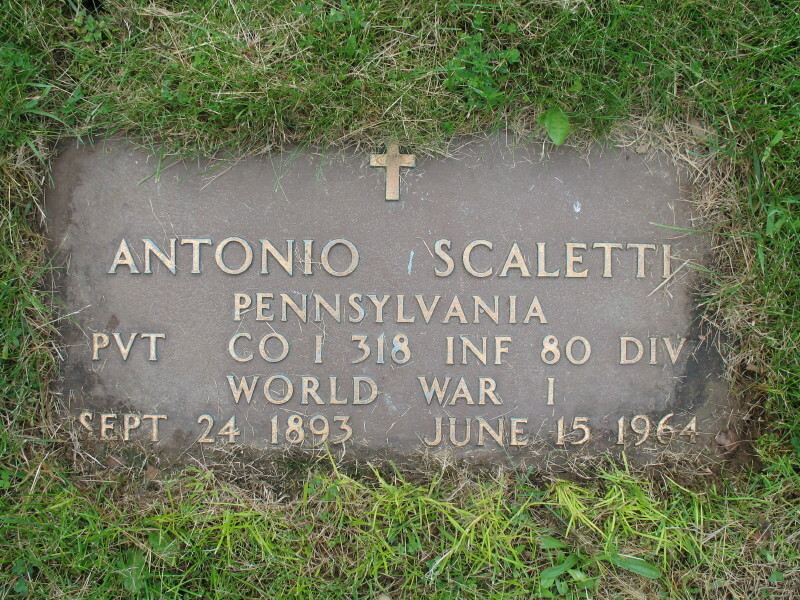 Carmelo, aka Uncle Charlie, received the name Scaletto. Nino received the name Scaletti, and a new American family was born. Once settled, Nino took work as a farm laborer for one Mr. Lockhart. My grandmother told me that Nino’s parents died in a fire. I haven’t yet found documentary evidence of this assertion. If it occurred, it was apparently after Nino came to America, for Nino’s father, Giuseppe, appears as a contact on Nino’s ship’s manifest. I’m not quite sure the whether Nino met his future wife before or after the outbreak of war, but Nino found himself back in Europe before long, fighting the Great War for the U. S. Army’s 318th Infantry, 80th Division. The army published a history of that regiment, which is now available online at Archive.org, and also as a print-on-demand reproduction from the Library of Congress, via Amazon.com.I bought a copy of the reproduction,but I have not yet read it. Nino appears on page 150, among a roster of enlisted men who sailed for France. I just now came across a video of some members of the 318th setting up Livens poison gas projectors in Chaumont. I can not say whether Nino is in the video. He likely is not, but surely he would have encountered these activities during his deployment. Nino married his wife, Katherine Balmer, in 1919, soon upon his return from the war. As I had mentioned in Episode No. 4 of this series, Katherine’s German parents did not approve of the union, so Nino and Katherine eloped, and were married in Maryland on the 17th of July, 1919. Also, as mentioned, Nino’s brother Joe hid his Italian identity by changing his name to Scally when starting his golf business. Nino, too, went by the name Scally for a short while, and appears under that name in the 1920 census. Nino an Katherine’s first child, Mary Belle, would arrive on July 2, 1920. Katherine would bear seventeen more children through 1944, including two sets of twins. 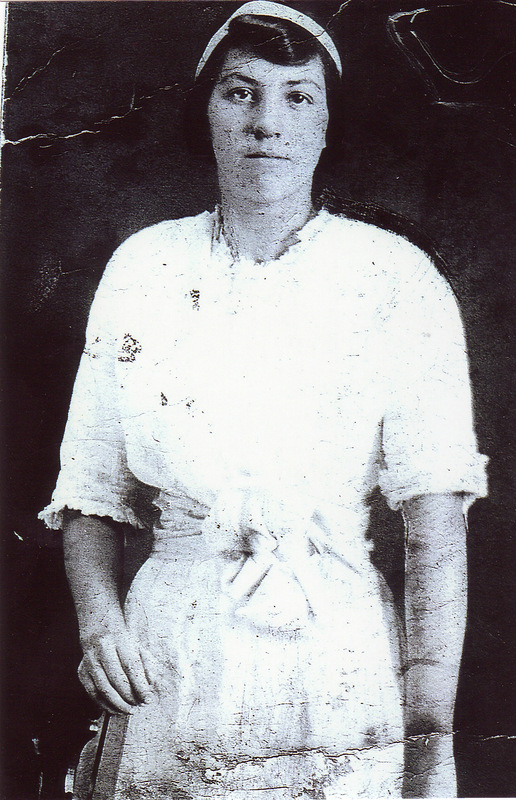 Four of Katherine’s children, including Mary Belle, did not survive childhood. My grandmother, Betty, was the couple’s fourth child. She told me some stories about him, for example, that he liked to sing and play ‘O Sole Mio on his accordion. My mother’s Uncle Bob, the youngest of the children, came to visit last year, he told us of more of the kids’ shenanigans. I’ll won’t soon forget when he erupted in his father’s heavy Italian accent: “They are a no gooda fo’ nothin!” Nino would blurt disparagingly of various flakes and scam artists, especially those who would took advantage of the vulnerabilities of new American immigrants. Uncle Bob can really channel his father; it was almost as if Nino were in the room with us. I would love to record Uncle Bob reciting his father’s various catch phrases. In time, the large family would drift apart, at least spatially. Although most of the family headed toward various western states, my grandmother, Betty, and her sister, Alice, headed east to Philadelphia. As a result, I knew very little about my mother’s family growing up. Only recently, though the magic of facebook social networking, have I begun to meet my mother’s cousins, virtually, to learn from them the Scaletti family story. Great distances could not divide that tight-knit clan. Find-A-Grave image of Nino’s grave, via ‘Genealogy Love’. My mother met Nino in Coraoplis once, in his later years. My grandmother took my mother out there in January of 1963 for her third birthday. My mother remembers of Nino only that he wore very large boots. These were likely a sturdy pair of farming boots. I suppose that just about everything looks huge to a three-year-old. Nino was a relatively small man, like me, at 5’6″, 135 lbs., according to his World War II draft registration card. He appears with a wiry frame in many later pictures. Nino died the following year, on June 15, 1964, of a lingering illness. His gravesite would be the first that I would find through a Find-A-Grave photo request, courtesy of Find-A-Grave user Genealogy Love. I was happy to return the favor with some photos of Philadelphia-area graves. After Nino’s death, Katherine moved to California with some of her children, and remained their until her death in 1972. The photo of Nino that I chose for Nino is one of my favorite restorations ever. It was one of a multitude that my mother’s Uncle Bob brought with him during his visit with us last year. Although very heavily damaged, I was able to rebuild a missing eye from what remained of the surrounding area. When zooming up close, one can tell that the image had been digitally modified, but on casual glance, in my opinion, the repair works. So impressed was I with this restoration that I first imagined that people might pay me to do this sort of work, and people have. 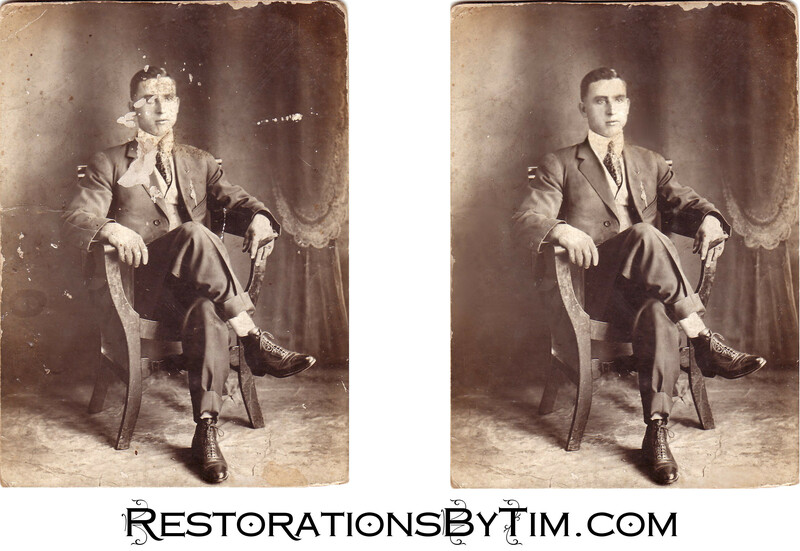 That is how Photo Restorations by Tim G. was born, and restoring the damaged images of all the world’s Ninos continues to be pleasure. Many thanks to my grandmother, Betty, for handing down the family history, to Uncle Bob for bringing that history to life, to Uncle Carl for sending the picture of Katherine, and to cousins Michelle and Linda, for befriending me on facebook and contributing many useful documents. 52 Ancestors, No. 12. Sorrelona Angeline Butera: Big Sister | Photo Restorations by Tim G.